Newly opened in 2017, the THB Naeco Ibiza has quickly become the talk of the town offering an elegant option for those wishing to enjoy a relaxed break whilst also able to simple the finest of the San Antonio nightlife which is within a short walking distance. Located at the beginning of San Antonio bay, only 8 minutes walk from O Beach Ibiza, 50m from the beach and offering stunning ocean views, this hotel is chic, sleek and unique. Boasting a spectacular pool area plus chill out zone, gym and a delicious poolside menu, the THB Naeco Ibiza has surpassed expectations. All guests who book directly with ourselves will enjoy free entry to O Beach Ibiza from Monday to Saturday plus 50% discount on Sundays. 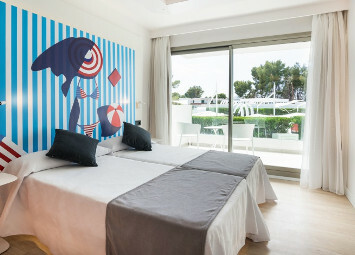 Exclusively designed for style and comfort, these spacious rooms feature all the amenities you would expect to make the most of your Ibiza holiday such as wifi, air con, balconies and safes. To accommodate up to 3 guests.